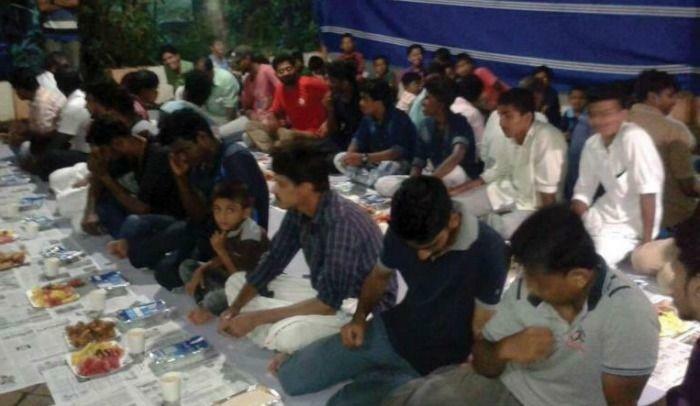 KERALA: The Lakshmi Narasimhamurthy Vishnu Temple, in Punnathala, invited Muslims for a vegetarian iftar party. Some 500 Muslims, including men women and children from the area, attended the iftar. As unusual as it sounds, the temple authorities held the iftar as a token of appreciation to the members of the Muslim community, who had contributed to the restoration of the century-old temple. The Iftar was a part of the week-long Punaprathishta (restoration) of the idol and Naveekarana Kalasham (renovation) at the temple. The restoration ceremony which began on Monday will conclude on Sunday. Cherusseri Unnikrishnan, the temple committee president said that the people of the village live like a family and religion has never come between as a dividing factor.He also recalled that not just financial contribution, youths from Muslim community had joined hands with the Hindus during the restoration works.